The full company list, product list, methodology, and notes can be found here. 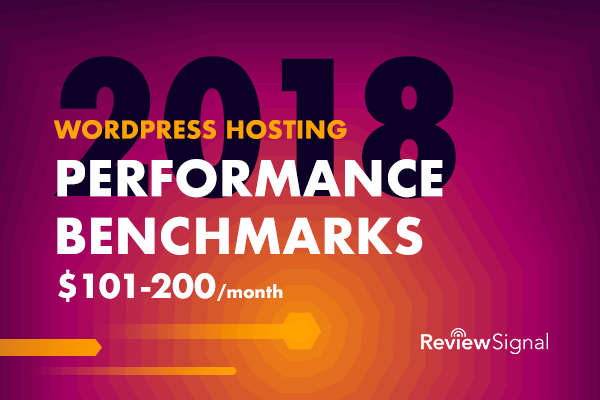 This post focuses only on the results of the testing in the $101-200/month price bracket for WordPress Hosting. Click the table below to see the full product specifications sheet. This test scaled from 500 to 4000 users over 30 minutes with 10 minutes at the peak. Kinsta handled this test without issue. Pressable had the same Tokyo issue but otherwise was just fine. LiquidWeb [Reviews], Nestify and Nexcess had increased response times then errors. Disclaimer: Liquid Web was the only website with SSL enabled which penalized their results versus their peers. This test scaled from 1 to 3000 users over 15 minutes. Error count capped at 5,000. Kinsta and Pressable handled this test without issue. LiquidWeb [Reviews], Nestify and Nexcess struggled with this test showing signs of load which resulted in errors and increased response times. All companies did well on the uptime monitoring. There isn't a whole lot to say since this is a non-impacting metric in terms of the results. Nobody had huge issues. I looked at the aggregate change again for the locations which were similar. There were 8 companies last year in this price bracket and only five this year. Across the nine same locations used, there was a cumulative decrease in response time of 2.68 seconds. For instance, Dulles dropped from 1.10 to 0.42 seconds on average. Kinsta had the fastest PHP bench and Liquid Web had the fastest WP bench. The average PHP bench went from 10.75 to 11.07 from the 2016 benchmarks in this price tier. The average WP bench went from 702 to 664. The PHP and WP bench both dropped in this price tier. One thing to note is that WP bench scores can vary tremendously based on the database architecture. You'll often see faster scores on architectures running the database locally compared to ones that run separately or have redundancy built in. 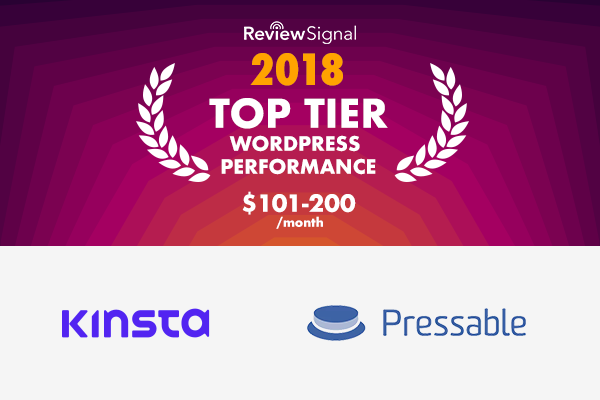 Kinsta and Pressable both earned Top Tier status this year for going through all the tests without any significant issues. Yet another Top Tier performance from Kinsta. Perfect uptime and near perfect load tests. It's starting to feel redundant writing that. LiquidWeb [Reviews] was at a huge disadvantage by keeping SSL enabled which substantially reduces performance in my experience. I offered to let them turn it off since no other competitors at this price tier were running it. They declined saying they do HTTPS on all the sites and would be tested as such. They kept perfect uptime but struggled with the load tests which SSL would play a a part. I'm sad to see them lose their Top Tier status they earned last year but I really respect their decision to keep SSL on knowing it wouldn't look as good on these tests because all clients get SSL. Nestify continues to be hampered by the 100 Mbps limit which hurt their Load Impact results. Their uptime was good. Load Storm left room to be desired. Nexcess kept good uptime but the load tests again caused issues. I know they were working on lots of upgrades to deploy customer wide based on these results and look forward to seeing the results of the improvements next year. I don't think any company has been as open and transparent about discussing their infrastructure and less than stellar results. I have a lot of respect for that type of openness. Pressable continued to have the weird Tokyo datacenter quirk for Load Storm. But beyond that the performance was near perfect. Another Top Tier performance. Awesome data as always, thanks! I would suggest however that all sites should be tested HTTPS in the future, at least on everything above the cheapest shared hosting. We no longer develop any sites without HTTPS, and generally speaking we don’t see a performance hit like we did years ago. Maybe that’s the host, maybe that’s because HTTP/2 comes along with that. Pressable meters based on Pageviews not Visits. I assume 5 pageviews per visit on avg. It would be useful if you explain the purpose of each of the load test and storm test columns (eg Peak Avg Load Time, etc) . The post does not analyse the numerical results but jumps to a conclusion . ( eg. had increased response times then errors). so this was the pricing when it the testing started. Pricing changes over time unfortunately and it’s a bit awkward to keep track of which company belongs where because prices, features, specs may change. You are correct on pageviews for Pressable, if you click the image, the exact specs are given. Thanks for pointing that out. I’m going to need to figure out a better way to do columns for mini images. It certainly can be frustrating how non standardized things are. The load tests are talked about in more detail on the main methodology page. There is a bit of an assumed knowledge and understanding about high performance websites. I should work on some more explanatory content to help readers. Thank you for the feedback!